I watched Batman Begins and the Dark Knight today, both of them directed by Christopher Nolan and starring Christian Bale as our batty hero. Batman Begins annoyed me for a lot of reasons. The main one would be that Bruce Wayne has very little compassion. Kudos to him for not executing the murderous Chinese farmer but still, overall I don’t think Batman develops any commendable ethical judgements in this movie. He doesn’t really embrace his fear of bats in the way that is portrayed by the script, but they become more a vehicle for his anger. He uses terror to find his answers. Also, his parents were murdered by a homeless, hungry, destitute man and yet he is on a quest to find ways to “fight injustice and turn fear against those who prey on the fearful”. He doesn’t stop to question why this man felt compelled to commit armed robbery, or accept that not all justice can be found in courtrooms and jails or other forms of law enforcement. It bugs me that he has decided he is a superior person who is able to deal out his form of justice with no repercussions. The issue of fear and those who prey on the fearful: I have yet to meet, see, hear or read of a person who does not fear something. A little pain goes a long way, and I think humans have self-preservation on high priority. A little pain can become a lot of pain and eventually, the mind and soul can’t handle it. So people fear pain, and how that it can begin their own oblivion. Does Batman not also prey on this fear in his ‘enemies’? So how can he claim to be ethically any better than them? It is interesting how Batman is visually portrayed as well. Without a mask he is Bruce Wayne, a handsome billionaire who takes at least two different women to every social event. As Batman, he is dark, uses some kind of voice changer (????? ), and filled with anger. I think it is the anger that drives him more than whatever morals he might have that he is trying to protect. Murder is murder, irrespective of who or what the body was when it was alive. How can murder be justified with ‘he was a bad person’ or something to that effect? this is probably my main problem with Batman and his ‘crime fighting’. If this was addressed in the film then I might be able to forgive it, but it fails to do so. Granted this is only one perception of the Batman character (the original was much more light-hearted) and I have limited knowledge of him in his comics, so perhaps my opinion is skewed. As a film, Batman Begins was very well made and well acted, but I did not find it entertaining due to the moral and ethical sandstorm in creates in my mind. The Dark Knight, in comparison, was far more entertaining. Heath Ledger plays the Joker, a mentally unstable character with a thing for knives, anarchy and blowing stuff up. I personally love the Joker. 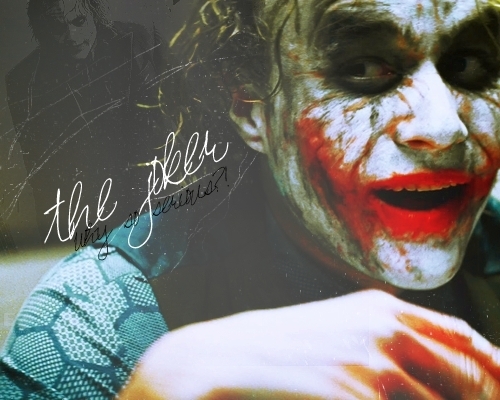 Apart from the fact that he was brilliantly acted by Heath Ledger, he is an honest character. Unlike Batman, he doesn’t lie about what he believes in, or try and make up weak justifications for what he does. While I’m not sure he goes about it the right way, he has a point to make and he makes it well. Or rather, the film does. The ending portrays very well that while it is true that individual people can fall, become hateful and vengeful, lose sight of reason or logic or a sense of self significance, as a whole, as a society of emotional human beings, we cannot pull the trigger on another social group without a deep sense of guilt or betrayal. I feel this is an important message to be putting into mass media, and helps perpetuate love, compassion and forgiveness, at the very least to the subconscious mind. Even if this is just an ideal that might not really unfold the same way if it were recreated in reality, it is an important ideal. reason for doing what they do, and it makes sense to them. Two-Face: It was your men, your plan! The Joker: Do I really look like a guy with a plan? You know what I am? I’m a dog chasing cars. I wouldn’t know what to do with one if I caught it. You know, I just… do things. The mob has plans, the cops have plans, Gordon’s got plans. You know, they’re schemers. Schemers trying to control their little worlds. I’m not a schemer. I try to show the schemers how pathetic their attempts to control things really are. So, when I say… Ah, come here. The Joker: When I say that you and your girlfriend was nothing personal, you know that I’m telling the truth. It’s the schemers that put you where you are. You were a schemer, you had plans, and look where that got you. The Joker: I just did what I do best. I took your little plan and I turned it on itself. Look what I did to this city with a few drums of gas and a couple of bullets. Hmmm? You know… You know what I’ve noticed? Nobody panics when things go “according to plan.” Even if the plan is horrifying! If, tomorrow, I tell the press that, like, a gang banger will get shot, or a truckload of soldiers will be blown up, nobody panics, because it’s all “part of the plan.” But when I say that one little old mayor will die, well then everyone loses their minds! As a film; The Dark Knight was well made, well acted, and entertaining. Perhaps having the Joker in there to counteract Batman’s painful narrow mindedness helped me enjoy it more. I believe you’re being over-analytical of a movie based on a comic book series. However, everybody has the right to a fair and just defence so I will argue on Batman’s behalf. First and foremost, Batman does not murder anyone, in fact he goes out his way to ensure that he doesn’t. At the end of The Dark Knight he makes an effort to save the Joker, despite the fact that it would be beneficial to let him fall to his death, thus alleviating the risk of him escaping again to go on yet another murderous rampage. He ensures that the Joker will face justice in a manner befitting contemporary society, giving him the opportunity to plead his innocence and have the decision of his guilt made by a jury of his peers, rather than simply leaving him to die. I do not believe that he is filled with anger when he puts on his costume, he merely creates a persona that allows him to portray himself in a strong manner as well as seperating Batman from Bruce Wayne. He hides himself because what he does is technically illegal and if the police were aware of who he truly was, he would be arrested. It would affect his business and his various colleagues if the public were made aware of his true identity. With regard to the use of a voice changer, I think he just smokes a few cigarettes then goes out to fight crime. Although his methods might be unorthodox, and in some cases extreme, it is an effective method which creates fear amongst those who would otherwise commit potentially atrocious crimes. He does show some level of moral limitations, for instance, when he is arrested in Asia for theft, it is worth noting that he was, in essence, stealing from himself. My argument is somewhat speculative, I will admit it has been some time since I’ve seen these movies. However, I will certainly put some more consideration into your interesting argument and see what I can come up with. This entry was posted on June 29, 2010 by Kodiko in Arts.